I recently wrote a Top Ten Tuesday blog post about books that have inspired me to try or learn something new. And I hinted in that blog post that I'd be saving one particular book for its own upcoming post and ...here it is! I love it when books inspire. You can see from that TTT that there have been ways that books have inspired me over the years. Mostly in terms of my creativity. I love trying out new types of artistic ventures and I'm sure that won't stop any time soon. But I also just loved being inspired in general. It doesn't have to come from books. Colours inspire me, nature, people. Without trying to sound overly cheesy, here's plenty of inspiration all around. But today's inspiration is literary inspired. I recently, as you may have noticed, taken an interest in poetry. 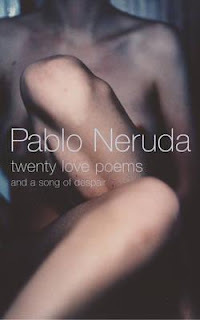 And one of the first collections of poetry that I bought myself was Twenty Love Poems and A Song of Despair by Pablo Neruda. I just adore Pablo Neruda's poetry but I've only ever read his poetry on free poetry websites or in collections of other poetry together with other poems and poets. What I really wanted to do was read Pablo Neruda on his own and probably especially this collection of his poetry. Love poetry! I think Pablo Neruda is so passionate and sensual ...and the earliest poetry I've read of his was always poems where I felt like every word was beautiful, each poem deserved to be read aloud and savoured. So, yes. I bought this book of poetry ... and as expected, I loved it. I wanted to read every poem aloud, I wanted the language he chose to wash over me. That was all to be expected. But what I didn't expect was that each of these poems were presented in the Spanish that Pablo Neruda (I'm assuming?) originally wrote the poems in and also the English translations. And when I was reading these poems I began to wonder what, if anything, might be lost in translation? Would his work be even more beautiful in the original (maybe?) Spanish? And also, I really wished that I had a better grasp of the Spanish language in order to read these poems in Spanish. I took several years of Spanish in high school. And I was pretty good at it. They even allowed me to skip my second year of Spanish and transfer immediately from my first year to third year Spanish because I had a natural ability. And I guess enthusiasm for learning languages. It was something that I really enjoyed when I was younger and I'd forgotten that throughout the years since then. So reading this book, seeing something I adore written in Spanish, meant that I was inspired. And because I wanted to take up Spanish again, and because I wanted to brush off all the cobwebs in my brain and get going again instead of putting it off or delaying ...I did. 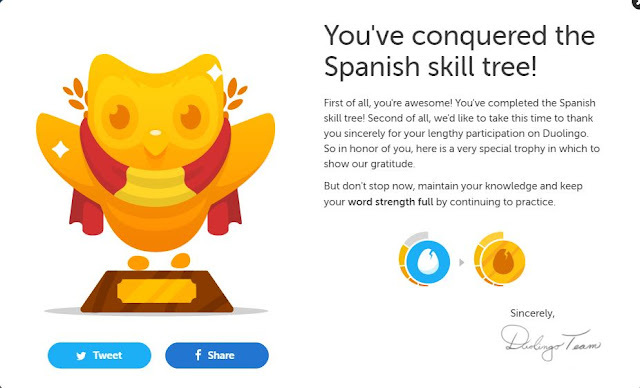 I took up a Duolingo course ... and within 88 days had completed their Spanish course. It was a pretty amazing two months. I loved having this ... purpose. I loved being able to easily see a goal of mine being achieved. I had a lot of fun delving into verb tenses and vocabulary. And it seemed to eat into all areas of my life ... I'd be in the garden with N and the boys having a conversation and would just automatically translate what was being said into Spanish. It was the most fun I've had in ages. I found the entire Duolingo website easy to use, including the mobile website. At times I had some issues with the microphone but it wasn't a big problem at all. I liked that the lessons were quite varied and interesting and because of the shortness of them, I was able to breeze through many in a day rather than relying on the recommended two lessons per day. I had so much that I'm contemplating starting up a French course. Possibly starting this course alongside E and The Littlest? We'll see. And while I can't say that I can specifically read Tonight I Can in Spanish, at least I'm one step closer. I was even given a Spanish translation of my favourite children's book in order to work through in order to kickstart a more practical approach to learning Spanish. Here's to carrying on my Spanish skills! I hope to some day soon be sitting at a cafe in Spain ordering my food and drink with confidence!